The first four articles for McIlvainea Volume 19 are ready for posting as of April, 2010. I am especially excited to have a very thorough discussion of how mushrooms species names are determined which appears in the lead article by Dr. Todd Osmundson, “Phylogeny, Natural Selection and the State of Mushroom Classification.” An early version of the abstract of his paper will appear in The Mycophile. Todd was the winner of the 2007 NAMA Memorial Fellowship (in honor of Bill Cibula). Dr. Osmundson is at the Department of Environmental Science, Policy & Management and Berkeley Natural History Museums, University of California, Berkeley, CA 94702, U.S.A. The second article is the 2009 NAMA Toxicology Committee Report. While I am the author of the report, it represents the efforts of over 100 NAMA Toxicology Identifiers throughout the United States and Canada who have sent in their reports throughout the year and then reviewed the paper in its draft form. While the total number of reports for the year was lower than normal, unfortunately there were five deaths from mushrooms during the year – four of them due to amatoxin. After over 30 years of collecting toxicology data, one would think that we had pretty much learned all there was to know about mushroom poisoning in North America. However, as happens every year, you will read about several new insights. A summary of the 2009 Toxicology Committee Report will appear in The Mycophile. The third article to start off Volume 19 of McIlvainea is about the Pacific Northwest Key Council, a group formed in 1974 to deal with the challenges of identifying mushrooms in the Pacific Northwest in an era before the proliferation of mushrooms field guides and before there was easy exchange of information over the Internet. Today the Key Council has 53 dedicated members, both serious amateurs and professional mycologists interested in fungal taxonomy (Figure 1). Fig. 1. 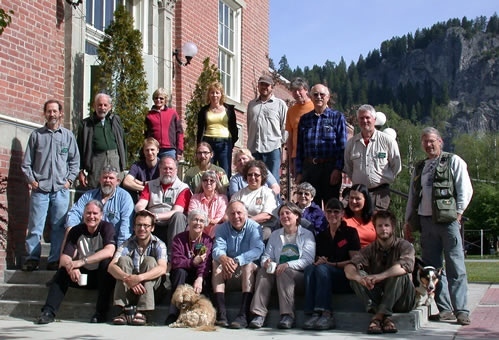 The Pacific Northwest Key Council at Metaline Falls, Washington, May 19, 2008. Read about how to access the 65 keys to Pacific Northwest species now available free on the Internet and learn how to obtain a copy of the Matchmaker CD by Dr. Ian Gibson. Matchmaker is a program that allows you to key out over 2,000 species of gilled mushrooms thought to occur in the Pacific Northwest and by the end of 2010 will also allow you to key out over 1,900 species of non-gilled mushrooms. 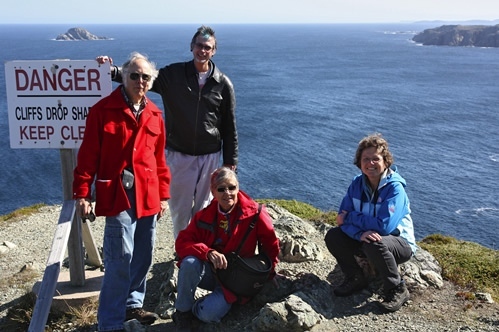 We raise the question of whether or not the Key Council can be a model for other organizations of amateurs and professionals working together to improve our understanding of the Natural History of North America. In September, 2009, I was one of six guest mycologists at the Foray Newfoundland and Labrador held for the second year at the Lion Max Simms Camp in Central Newfoundland (Figure 2). Andrus Voitk is a driving force of that organization and their vision is to bring together the guest mycologists and local mycologists for four days of collecting before the foray begins plus the three days of public events and public forays led by the guest mycologists teamed with local mycologists. A huge data collection team photographs and records the mushrooms and beautiful reports are then published on the Internet. In 2010, this delightful foray moves to The Great Northern Peninsula of Newfoundland (http://www.nlmushrooms.ca). Like the Key Council, the goal of the Foray Newfoundland and Labrador is to improve knowledge and information about the mushrooms in their part of the world. It is another interesting model for how amateurs working with professionals can help improve our understanding of Natural History. It would be great to have an article for McIlvainea about what they have learned so far. Or do any of you have models that you would like to write about for McIlvainea? Amateurs in North America lag far behind their counterparts in Europe and it is clear that there will never be enough funding for professionals to answer the many questions that remain about our natural world. Submissions of short articles and letters are welcome as are full articles. Articles will be sent out for review and every attempt will be made to promptly publish your submissions. Instructions for authors can be found in a quicklink on the right side of this page. McIlvainea Volume 19 will hopefully grow well beyond these initial three articles as 2010 progresses. As each new article comes in and is reviewed, it will be posted to the internet and the contents page of McIlvainea will be expanded. I will also send The Mycophile a short article about any new submission so that NAMA members will be alerted as to when to check the NAMA website for updates to McIlvainea. Send manuscripts to Michael W. Beug, PhD, PO Box 116, Husum, WA 98623; or by email to beugm@evergreen.edu.